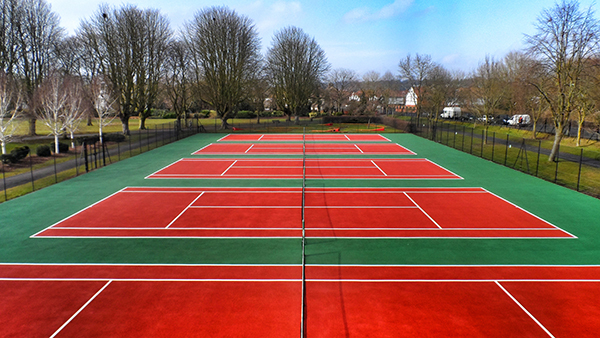 Tennis courts surfacing are designed and specified to be porous to allow the surfacing to be an all weather recreational area and these are designed for the variable types of surfaces from open graded porous macadam surfaces, polymeric rubber sports surface to synthetic grass flooring options. Macadam Surfacing – Tarmac open textured surface with an aggregate rich acrylic paint for various sports. We can install macadam tennis surfacing http://tenniscourtcontractors.co.uk/surfaces/porous-macadam-sports-surfaces/ to suit a variety of sizes and designs. For more information regarding the different types of surfacing and details of funding for tennis facilities please fill out our contact form today and we'll be in touch with some professional advice. Or simply click here - http://tenniscourtcontractors.co.uk/other/tennis-court-funding/ to learn more regarding funding. We can provide you with answers regarding the cost of a maintenance package, prices of regular servicing and the recommended equipment to ensure that the pitch is working to its maximum potential. When constructing a tennis court it is important that you take a look at a range of companies to find the best results. Some tennis courts businesses claim to be professional and experienced, hoewever they may not be able to give you exactly what you are looking for. We always recommend that you ask to look at case studies and previous work of construction companies, to ensure they are credible and have high standards. As sports surface specialists, we only use the best quality products to achieve the best results. Please let us know if you're interested in finding out more or to speak to a member of our team. Players on the tennis courts whether this is on private garden areas, school MUGA courts, professional clubs or their surrounding areas all want to play on a safe court so the maintenance procedures are vital in making sure annual programmes are put in place for basic repairs, weed growth prevention, jet wash cleaning and respraying anti slip coloured coatings with new line marking http://tenniscourtcontractors.co.uk/applications/tennis-court-line-marking/ which can improve your facility. If you are interested in finding out more about the surface types we may install for sports facilities, please fill in our enquiry form. 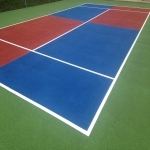 Once we receive your enquiry we will get back to you with more information on tennis courts surfacing and the costs of the different surface types.